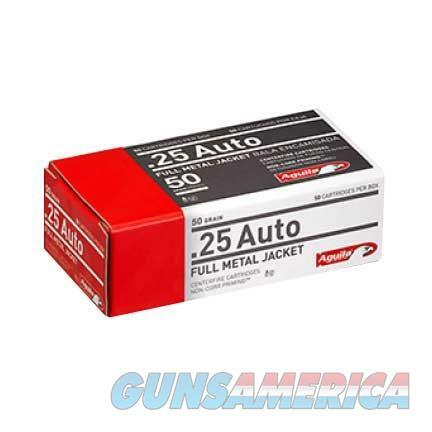 Description: Aguila 1E252110 HANDGUN AMMO 25 ACP 50GR HANDGUN Aguila Centerfire Handgun Ammunition. The Aguila Advantage will hit dead center. A wide variety of calibers from the standard to the unique, Aguila offers high-quality rounds that cycle flawlessly with remarkable consistency in both velocity and accuracy. The use of Non-Corr Priming means reliable ignition in any weather condition.